Earlier this year, the New York Post reported that the Manhattan District Attorney’s office had opened an investigation into the death of Dorothy Kilgallen, who died 51 years ago while investigating the death of President John F. Kennedy. This new investigation was inspired by a new book by criminal attorney Mark Shaw, The Reporter Who Knew Too Much: The Mysterious Death of What’s My Line TV Star and Media Icon Dorothy Kilgallen. The untimely death of reporters, movie makers and authors are always worth noting. Someone interrupts the covert flows, creating liabilities for those managing events. Interrupters must be dealt with, transparency is not allowed. An assassin is sent. For a brief period of violence and grief, a death marks the unreality of our official story. That is why so much can be learned about what is truly going on by studying these deaths as the anomalies that give the underlying powers away. An extraordinary number of people were killed to cover up the conspiracy that ordered and financed the assassination of President Kennedy. 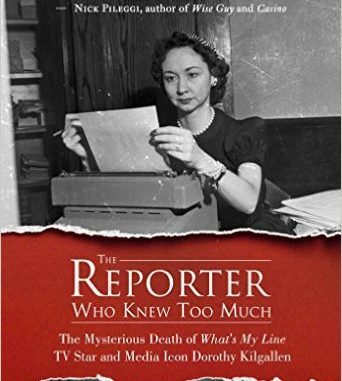 Like so many of them, the story of Dorothy Kilgallen’s life and death is a reminder that many bright and brave people live among us and fight for the truth every day. Compliments to attorney and author Mark Shaw for making sure such an important story is not forgotten.